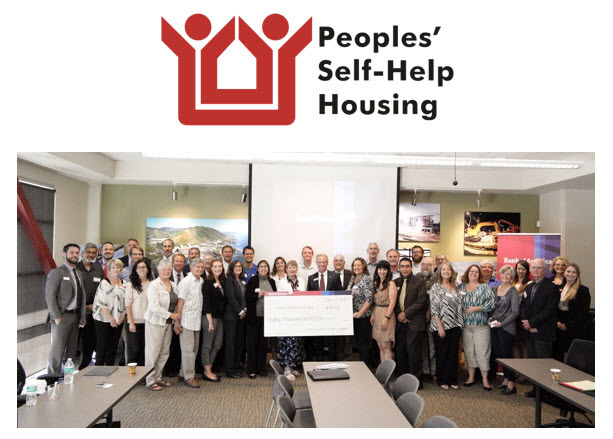 Central Coast, August 25, 2016 – Peoples’ Self-Help Housing (PSHH) announced it has been awarded a $10,000 grant from Bank of America in support of their critical affordable housing developments and support programs for their residents in the Tri-Counties. The Bank of America Charitable Foundation strives to advance local economies and create positive change. The grant to Peoples’ Self-Help Housing will support affordable housing and programs leading to self-sufficiency for low-income families, seniors, the disabled and other special needs groups. “The need for safe housing that is within reach of hardworking families and individuals has never been stronger in our community, and I’d like to thank Bank of America for showing it is committed to helping us meet this fundamental need,” said PSHH CEO/President John Fowler. This grant is part of an $80,000 commitment from Bank of America supporting local community partners.